October 1922: he makes his first stage appearance, at the Shintomiza, where he receives the name of Nakamura Kotarô III and plays in the drama "Shinden Sandaiki". August 1933: his brother Nakamura Fukusuke V dies. November 1933: Nakamura Kotarô III takes the name of Nakamura Fukusuke VI at the Kabukiza. May 1936: revival of "Nanatsu Men" at the Kabukiza; Fukusuke plays the role of Princess Sakura [casting]. 12 September 1940: his father Nakamura Utaemon V dies. October 1941: Nakamura Fukusuke VI takes the name of Nakamura Shikan VI at the Kabukiza, playing in "Ehon Taikôki", "Rokkasen" (the role of Ono no Komachi), "Kanadehon Chûshingura" and "Suzu-ga-Mori" (the role of Gonpachi). March 1951: Shikan plays for the first time the difficult role of Masaoka in the drama "Meiboku Sendai Hagi", which is staged at the Meijiza. His stage partner in the role of the cruel Yashio is Morita Kan'ya XIV. April 1951: Nakamura Shikan VI takes the name of Nakamura Utaemon VI at the Kabukiza, playing the roles of Omiwa and the snake disguised as the dancing girl Hanako in the drama "Mikasayama Goten" and the dance-drama "Kyôganoko Musume Dôjôji". May 1951: Nakamura Utaemon VI celebrates his second month of shûmei at the Kabukiza, playing the roles of Princess Yuki and the snake disguised as the dancing girl Hanako in the drama "Kinkakuji" and the dance-drama "Kyôganoko Musume Dôjôji". June 1951: Nakamura Utaemon VI celebrates his shûmei in Nagoya at the Misonoza, playing the roles of Onatsu, Kagaribi and Masaoka in "Onatsu Kyôran", "Moritsuna Jin'ya" and "Meiboku Sendai Hagi". October 1951: Nakamura Utaemon VI, Matsumoto Kôshirô VIII and Nakamura Kanzaburô XVII celebrate their shûmei in Ôsaka at the Ôsaka Kabukiza; the new Utaemon plays the roles of the snake disguised as the dancing girl Hanako, Kagaribi, Tokiwa Gozen and Okaru in "Kyôganoko Musume Dôjôji", "Moritsuna Jin'ya", "Ichijô Ôkura Monogatari" and "Ochiudo". December 1951: Nakamura Utaemon VI celebrates his shûmei in Kyôto at the Minamiza, playing the roles of the spirit of the Lion, Chiyo and the courtesan Yatsuhashi in "Kagami Jishi", "Terakoya" and "Kagotsurube". July 1952: premiere at the Kabukiza of Hôjô Hideji's drama "Kitsune to Fuefuki"; Utaemon plays the role of Tomone [casting]. November 1952: premiere at the Kabukiza of Kema Nanboku's revision of Chikamatsu Monzaemon's drama "Daikyôji Mukashi Goyomi"; Utaemon plays the role of Osan [casting]. June 1953: Utaemon plays at the Kabukiza the role of the keisei Yayoi (in reality the spirit of a shishi) in the dance "Makura Jishi", which is based on a new choreography created by Fujima Kanjûrô VI. July 1953: premiere at the Meijiza of Hôjô Hideji's drama "Ukifune"; Utaemon plays the role of Ukifune [casting]. 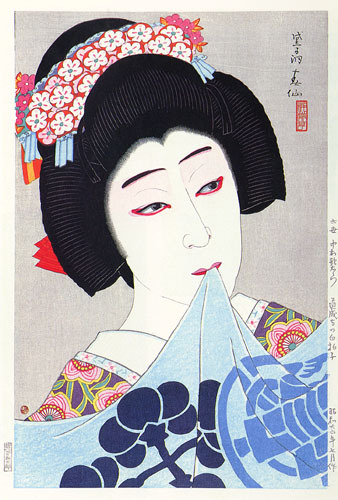 Revival at the Meijiza of Kawatake Shinshichi III's 1878 drama "Tsûzoku Saiyûki"; Utaemon plays the role of the queen of the Sairyô Province, in reality the spirit of a giant spider [casting]. March 1954: revival at the Kabukiza of the dance-dramas "Oshidori" and "Imayô Suma no Utsushie"; Utaemon plays the roles of the keisei Kisegawa and the spirit of the female mandarin duck in the former dance-drama [more details] and the role of the ama Matsukaze in the latter dance-drama [more details]. July 1954: revival at the Kabukiza of the dance-drama "Oshidori" as part of a regular Kabuki program; Utaemon plays the roles of the keisei Kisegawa and the spirit of the female mandarin duck [more details]. November 1954: premiere at the Kabukiza of Mishima Yukio's comical play "Iwashi Uri Koi no Hikiami"; Utaemon plays the role of the courtesan Hotarubi, in reality the Princess of Tankaku Castle, [casting]. February 1955: Izumi Kyôka's drama "Tenshu Monogatari" is staged for the first time with Kabuki actors, at the Kabukiza; Utaemon plays the role of Princess Tomi [casting]. February 1955: revival at the Kabukiza of Sakurada Jisuke I's dance-drama "Kumo no Hyôshimai"; Utaemon plays the role of the shirabyôshi Tsumagiku, in reality the spirit of a ground spider [casting]. July 1955: premiere at the Tôhô Takarazuka Gekijô of Uno Nobuo's drama "Mômoku Monogatari"; Utaemon plays the role of Oichi-no-Kata. March 1956: premiere in Kabuki at the Meijiza of Hôjô Hideji's drama "Ii Tairô"; Utaemon plays the role of Oshizu-no-Kata [more details]. July 1956: revival at the Kabukiza of Tsuruya Nanboku IV's drama "Sumidagawa Hana no Goshozome", commonly called "Onna Seigen"; Utaemon plays the roles of Princess Hanako, the Shinkiyomizu ama Seigen and the ghost of the nun Seigen [more details]. Revival at the Kabukiza of the michiyuki "Chô no Michiyuki", in which Utaemon plays the role of Komaki; the role of Sukekuni is played by Matsumoto Kôshirô VIII. September 1956: revival at the Kabukiza of the Kiyomoto version of the dance "Takao Zange" in which Utaemon plays the role of the ghost of the keisei Takao. March 1959: revival at the Meijiza of the dance-drama "Kumo no Ito Oyozume Banashi"; Utaemon plays the roles of a young girl, the zatô Utashichi, the keisei Usugumo and the Spirit of the Spider (kumo no sei) [more details]. November 1959: revival at the Kabukiza of Tsuruya Nanboku IV's masterpiece "Sakura Hime Azuma Bunshô", which is supervised by Mishima Yukio; Utaemon plays the roles of Princess Sakura and Fûrin Ohime [casting]. January 1960: premiere (or revival?) at the Kabukiza of the dance "Kuruwa Sanbasô"; Utaemon plays the role of the keisei Chitosedayû [casting]. April 1960: premiere at the Kabukiza of Hagiwara Yukio's dance-drama "Onizoroi Momijigari"; Utaemon plays the role of Princess Sarashina, in reality the female demon of Mount Togakushi [casting]. June ~ July 1960: Utaemon takes part in the first Kabuki tour in the USA; He plays the roles of the courtesan Yatsuhashi, Osato, Kaoyo Gozen, the snake disguised as the dancing girl Hanako in the dramas "Kagotsurube Sato no Eizame", "Tsubosaka Reigenki", "Kanadehon Chûshingura" and the dance "Kyôganoko Musume Dôjôji" [casting]. June 1962: revival at the Kabukiza under the supervision of Takechi Tetsuji of Namiki Gohei I's drama "Keisei Yamato Zôshi"; Utaemon plays the roles of Kanzaemon's sister Komaki and Momonoi's daughter Princess Yayoi [more details]. April 1981: revival at the National Theatre of Nishizawa Ippô's drama "Keisei Hama no Masago"; Utaemon plays the roles of the keisei Ishikawaya Masagoji (in reality Akechi Mitsuhide's daughter Princess Satsuki) and Goemon's widow Gion-no-Okaji [casting]. December 1988: Utaemon plays for the last time the role of Masaoka in the drama "Meiboku Sendai Hagi", which is staged at the National Theatre. The cruel Yashio is played by Kawarasaki Gonjûrô III. April 1996: Utaemon appears on stage for the last time, in Tôkyô at the Kabukiza, where he plays the role of Oshizu-no-Kata in the drama "Ii Tairô". 31 March 2001: Utaemon dies in Tôkyô. Nakamura Utaemon VI's best roles: Masaoka ("Sendai Meiboku Hagi"), Princess Yaegaki ("Honchô Nijûshikô"), Princess Yuki ("Gion Sairei Shinkôki"), Princess Toki ("Kamakura Sandaiki"), Ono no Komachi/Sumizome/the spirit of the cherry tree ("Tsumoru Koi Yuki no Seki no To"), Akoya ("Dan no Ura Kabuto Gunki"), Princess Takiyasha ("Masakado"), Kasane ("Iro Moyô Chotto Karimame").